by Aileen of the goodtimesithinkso blog,where you will find other beautiful (and free) crochet patterns. 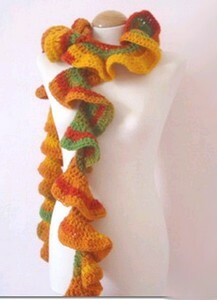 Completed in time for a village fall show in Scotland, this lovely spiral scarf is done in warm, rich autumnal colors, with fluid twists and turns, curves and movement incorporated in the design. If you change the yarn choice, adjust the crochet hook to suit your choice of yarn. Decide how long you want your scarf and chain for that length. I chained 180 sts. Row 1 – tr into 4th chain and each chain to end. Row 2 – ch 3 and *tr into next 2 sts, dtr in 3rd st* repeat until end. Row 3 – as row 2. Continue until desired width is achieved. I did five rows but the yarn was quite thick and the hook quite large. This pattern is so quick, easy and effective. I used 200g of wool. My scarf is quite long – at least 8ft – and fairly chunky. However if you use a lighter yarn and smaller hook the spiral will be tighter and more springy. At right, you can see the finished scarf wrapped around my mannequin umpteen times. This pattern is offered and made available for personal use only.